EYE was born out of research into the identity promoted by Tesla to achieve a new automotive objective: designing an everyday 2 + 2 sports car conceived to become a status-symbol. EYE is the product of the work of eleven Master Course students from the IED, coordinated by Luca Borgogno, senior designer with Pininfarina and by Andrea Militello, Senior Fiat designer. The Istituto Europeo di Design will be back once again at the Geneva Motor Show for next month's 80th edition to present another full-scale concept, the EYE, a futuristic concept car designed by the Master of Arts in Transportation Design – work experience a.y. 08/09 in collaboration with Tesla Motors. The Turin-based design school has made a habit in recent years of presenting the work of its students at the Swiss show, showing off projects such as the well recieved Fiat X1/99. 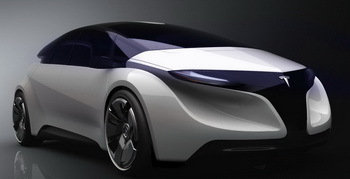 The new concept car, produced in a full scale model version, was born out of the Institute’s desire to test the ability of its young designers and discover their vision of the future: this led us to the choice of looking beyond traditional car manufacturers and join forces with a company which is synonymous with innovation. EYE is the outcome of a partnership between IED Turin and Tesla, a brand with its sights set on the future yet already manufacturing for the present, a company which produces 100% electric cars, whose green heart is perfectly in tune with its winning design, its sporting performance and the extremely pleasing driving experience its car offer. In step with the most recent environmental policies of the Californian Region, where they have their headquarters, Tesla looks to the European and Asian market with the awareness of being among the very first brands in the world to come up with an answer for global expectations for the future of the automobile. And IED was there to accept this challenge. EYE (length 4250 mm – width 1800 mm – height 1360 mm – wheel base 2650 mm) was born out of research into the identity promoted by Tesla to achieve a new objective: designing an everyday 2 + 2 sports car conceived to become a status-symbol, a car with engaging features and sports car performance ideally suited to a young, cosmopolitan target, particularly given its accessible price tag, and all those people who are constantly in touch with the world via the web and digital technologies. EYE could be the only electrical car in the C segment, but it has been conceived not to have to fear the competition of its petrol rivals: its secrets are its elegant exterior surfaces which conceal a green soul brimming with power. The positioning of the batteries under the back seat also allows a rational distribution of the internal spaces and an exploitation of the external bodywork which maximise the car’s efficiency and appeal. The aerodynamic solution goes hand in hand with an intelligent possibility for metamorphosis: a open top roof allows EYE to be transformed from a four-seater C segment car into a semi-open car with a loading bay styled very much after that of a Pick-up truck. The front mask in black plexiglas, which harps back to the T in the label, is on the other hand the result of a stylistic operation that has developed a new aesthetic element to be applied to all of the Car Manufacturer’s future products. EYE is the product of the work of eleven Master Course students, coordinated by Luca Borgogno, senior designer with Pininfarina and by Andrea Militello, Senior Fiat designer. The Master of Arts in Transportation Design – work experience course is a highly qualified two year training program, which prepares professionals to face up to the challenges they will have to deal with in the work place by putting them into constant and direct contact with companies and style centres. The concept car is in actual fact the result of a process marked by different assessment stages which simulate actual working conditions: beginning from the initial eleven individual proposals, five models were chosen to be produced in 1:4 scale clay models and one of these was then selected which seemed to have best answered the initial brief put forward by Tesla. The entire class, divided into groups, then worked on the chosen project in order to come up with the concept car in all its internal and external details. The supervision of Franz von Holzhausen, Tesla Motors’ Chief Designer was fundamental to the entire process, seeing as he has clearly managed to communicate to the students the values, objectives and enthusiasm of someone who contributes, every day, with their work, to building the future of the automotive sector. Eye was based on an idea by: Jorge Andrés Pinilla Fonseca (Columbia). The following worked on the project: Shaliq Abbas Ali (India), Taekun Choi (Korea), Stefano Cornetto (Italy), Siddharth Durbhakula (India), Weyen Luo (Taiwan), Jorge Eduardo Manzano Meléndez (Mexico), Pablo Agustin Pérez (Argentina), Jorge Andrés Pinilla Fonseca (Columbia), Daniele Pollastrelli (Italy), Ramprasadh Selvarajah (India), Umberto Severgnini (Italy). EYE was produced thanks to the collaboration of: Pirelli, OZ Racing. Next to the full scale model, IED Turin is also going to be presenting two 1:4 scale model concept cars in the stand, both designed by the students of the Three year Transportation Design – car design Course a. y. 08/09. The PYGMY jeep designed by Vasiliy Kurkov, a 2nd year student, who looks at the future of Fiat Chrysler, and, in the light of the recent agreements, imagines how the technical know how, the platforms and the values of the two labels may come together into a single vehicle which takes as its inspiration the Fiat Panda Cross 4x4, and Libido, a thesis project presented by Giuseppe Barbera, Andrea Guerri and Federico Vecchiatini, which is instead inspired by the Aston Martin brand and its values of excellence, sports performance and elegance, which they imagine transposed onto a vehicle designed for the 2025 market.